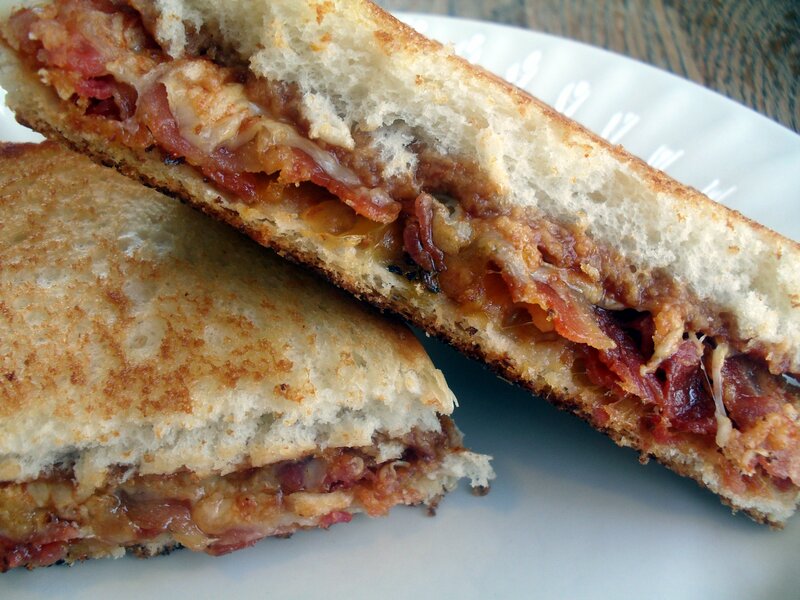 Barbecue Bacon Grilled Cheese Sandwich & Giveaway Winner! Yes, it’s true. This sandwich has cheese. It has barbecue sauce. It has bacon. And it’s wonderful! I came up with it last fall as an excuse to incorporate some of the Flatlanders Spicy Barbeque Sauce that I love so much into my lunch. Don’t you just love it when desperation leads to inspiration? One of the comments on the giveaway announcement, in response to “what’s your favorite thing to make with barbecue sauce?”, was using it as a dipping sauce for grilled cheese! So you see, great minds think alike! My other favorites include putting it on baked potatoes with nothing else (I can vouch for this idea–I’ve done it and it’s fabulous! ), mixing it with ranch for a dipping sauce, making grilled tofu with it, and using it as a sauce on sweet potato fries! As you can tell, I’m not a huge meat lover and my favorites reflect that. I do, however, have quite an affinity for bacon. Which leads me back to this sandwich. It has bacon on it. And you should make it. ‘Nuff said. Heat a skillet over medium. 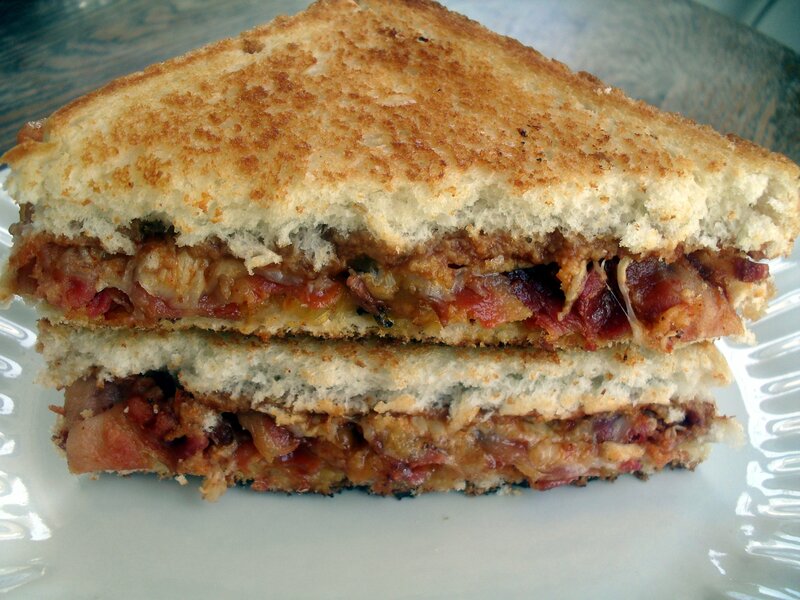 Spread the barbecue sauce over the bread slices, then over one slice arrange cheddar cheese slices, bacon over that, then sprinkle the Monterey Jack over the bacon. Top with remaining bread slice. Melt some butter or margarine in the skillet and place the sandwich on top of the puddle, scooting it around until the bread absorbs the butter. Cook for 5-6 minutes or until cheddar looks melted, then remove and melt more butter in the pan, flip the sandwich and cook additional 4 minutes and serve hot. Veronica’s Notes: Your sandwich will require several minutes less cooking time if you use regular bread. Also, the Monterey Jack isn’t necessary but I like to glue the bacon, cheese and bread all together by putting cheese on both sides. Change it up as you desire! OK, you’ve been patient and now I’ll get to the real reason you’re reading this post. :) It was so much fun hosting my first giveaway and thank you all so much for participating–I really enjoyed reading about your favorite things to make with barbecue sauce! Congratulations to Suzie, commenter #19, you’ve won the set of three Flatlanders barbeque products! Suzie, I’ll email you to get your address and get them out to you! Posted in Announcements & Awards, Burgers & Sandwiches, My Favorites and tagged bacon, barbecue, grilled cheese. Bookmark the permalink. 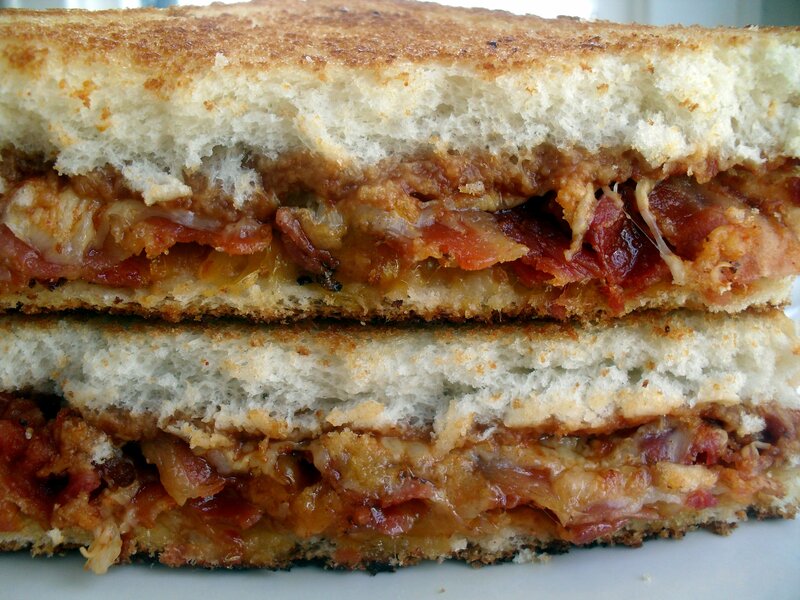 Now that you mention “stuff inside,” I think adding some sauteed (or even caramelized) onions to this sandwich would be heaven. I wonder if I’d be able to get my mouth around it? LOL! Nice sammie! Grilled cheese and tomato soup are a great quick weeknight meal and by golly, bacon makes it better! Wow! So cool I won *Doing the happy dance* lol! ;) Now, I’m going to print out this awesome sandwich recipe and wait to make it :) I don’t think I’ll change a thing either, it looks perfect just as you’ve cooked it. I’m hungry just looking at the picture. Thanks Veronica! I got your sauce out to you today so you should get it by Friday! Congrats, girl! That looked yummy. I think my husband would love, love, love it! By the way I linked you , like twice, in my latest post. I was being lazy…I hope that is okay. Again, that looks so good. We may have to go buy some bacon! This sandwich looks chock full of flavor — my favorite part is how it’s on Texas Toast! 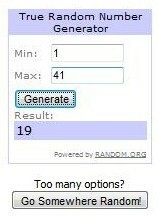 :) Congrats to the lucky winner! Yeah, flavor and FAT! he he he. I never would have thought of this combination, but it sounds EPIC! Yum!! that sounds soooo good, we will have to put it on the rotation of sandwiches…I know my girls will love it!! I have now! Thanks for the link–cool site. This sandwich sounds good!! I want this right now. Oh wow, just finished eating one of these. These guys are very rich but so good. I used Italian bread instead of Texas toast, now I want to know what the original tastes like. I also added some kettle cooked chips to the sandwich which was nice for just a little extra crunch. The recipe sounded so good that I made two of these but could barely make it through one, like I said, these are rich. I will be enjoying these on a regular basis now. Thanks for the feedback, Seth! I love your idea of adding chips-yum! As an at home chef I loved the idea of blending the cheeses. I recently made a grilled cheese with monterrey jack and it was amazing.